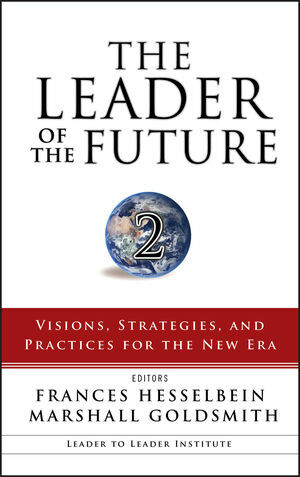 The Leader of the Future 2 follows in the footsteps of the international bestseller The Leader of the Future, which has been translated into twenty-eight languages, and is one of the most widely distributed edited collections on leadership to date. In twenty-seven inspiring and insightful essays, this book celebrates the wisdom of some of the most recognized thought leaders of our day who share their unique vision of leadership for the future. Returning Contributors: Ken Blanchard with Dennis Carey, Stephen Covey, Marshall Goldsmith, Charles Handy, Sally Helgesen, Rosabeth Moss Kanter, Jim Kouzes & Barry Posner, Richard Leider, Ed Schein, Peter Senge, and Dave Ulrich with Norm Smallwood. New Contributors: John Alexander, Darlyne Bailey, Howard Gardner with Lynn Barendsen, Usman Ghani, Ronald Heifetz, Joe Maciariello, Jan Masaoka, John Mroz, Brian O'Connell, Jeff Pfeffer, Ponchitta Pierce, Srikumar Rao, General Eric Shinseki, R. Roosevelt Thomas, Noel Tichy with Chris DeRose, and Tom Tierney. "Hesselbein and Marshall Goldsmith, one of the USA's top executive coaches, edited the collection The Leader of the Future 2. Its 27 eloquent essays provide a kind of hopeful, idealistic best-case scenario for future leaders of non-profits and businesses. This is not a cookie-cutter, how-to approach. The job of the essayists is to provide food for thought and goals. The high quality of writing here should inspire anyone who has aspirations for leadership." Marshall Goldsmith has been recognized for his outstanding work in leadership and management by the American Management Association, Business Week, The Wall Street Journal, Forbes, and The Economist. In addition to The Leader of the Future 2, Goldsmith is the author or coeditor of twenty-two books, including the upcoming What Got You Here Won't Get You There. Preface (Frances Hesselbein and Marshall Goldsmith). Part One: A Vision of Leadership. 1. Peter F. Drucker on Executive Leadership and Effectiveness (Joseph A. Maciariello). Part Two: Leading in a Diverse World. 2. Systems Citizenship: The Leadership Mandate for This Millennium (Peter Senge). 3. Diversity Management: An Essential Craft for Future Leaders (R. Roosevelt Thomas Jr.). 4. Ten Things I Learned About Leadership from Women Executive Directors of Color (Jan Masaoka). 5. How Cosmopolitan Leaders Inspire Confidence: A Profile of the Future (Rosabeth Moss Kanter). Part Three: Leading in a Time of Crisis and Complexity. 6. Anchoring Leadership in the Work of Adaptive Progress (Ronald A. Heifetz). 7. The Challenge of Complexity (John Alexander). 8. Understanding the Nonprofit Sector’s Leadership Deficit (Thomas J. Tierney). 9. Leadership Over Fear (John Edwin Mroz). 10. Leading in a Constantly Changing World (Ponchitta Pierce). 11. Leaders of the Future: Growing One-Eyed Kings (General Eric K. Shinseki). Part Four: Leading Organizations of the Future. 12. Philosopher Leaders (Charles Handy). 13. Leadership as a Brand (Dave Ulrich and Norm Smallwood). 14. Regaining Public Trust: A Leadership Challenge (Ken Blanchard and Dennis Carey). 15. Leading New Age Professionals (Marshall Goldsmith). 16. Tomorrow’s Leader (Srikumar S. Rao). 17. Challenges for Leaders in the Years Ahead (Sally Helgesen). 18. Leadership Judgment at the Front Line (Noel M.Tichy and Chris DeRose). 19. It’s Not Just the Leader’s Vision (Jim Kouzes and Barry Posner). Part Five: The Quality and Character of the Leader of the Future. 20. Leading in the Knowledge Worker Age (Stephen R. Covey). 21. Are the Best Leaders Like Professors? Teaching, Asking Questions, and Evidence-Based Management (Jeffrey Pfeffer). 22. The Leader Integrator: An Emerging Role (Usman A. Ghani). 23. Leadership Competencies: A Provocative New Look (Edgar H. Schein). 24. The Three Elements of Good Leadership in Rapidly Changing Times (Lynn Barendsen and Howard Gardner). 25. Distinctive Characteristics of Successful Leaders of Voluntary Organizations: Past, Present, and Future (Brian O’Connell). 26. The Leader in Midlife (Richard J. Leider). 27. Leading from the Spirit (Darlyne Bailey). Bestselling Brand on an evergreen Topic: The first edition sold 200,000 copies, and the Leader of the Future name is synonymous with this best-seller status. Leadership is an evergreen topic and the Leader to Leader Institute, Marshall Goldsmith, Frances Hesselbein, and all of the contributors have excellent track records. Best names in leadership: Contributors include: Peter Senge, Ken Blanchard, Stephen Covey, Sally Helgelsen, Rosabeth Moss Kanter, Charles Handy, Noel Tichy, Edgar Schein, General Eric Shinseki, Kouzes & Posner, and many other luminaries. Platform: Goldsmith and Hesselbein are excellent advocates, and both speak around the world, as do the contributors. "Hesselbein and Marshall Goldsmith, one of the USA's top executive coaches, edited the collection The Leader of the Future 2. Its 27 eloquent essays provide a kind of hopeful, idealistic best-case scenario for future leaders of non-profits and businesses.